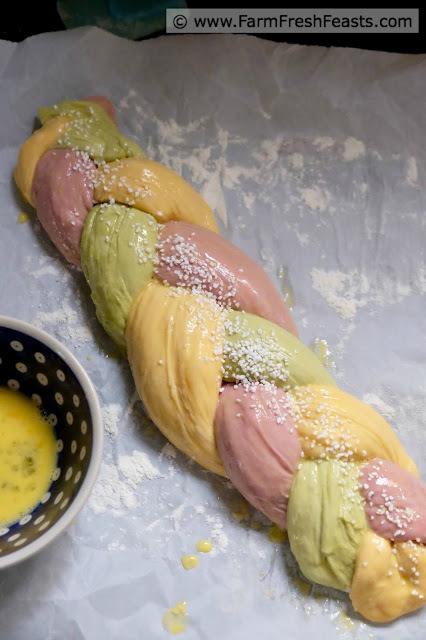 This festive bread is naturally colored with sweet potatoes and green tea to make a sweet braided loaf that's fun and nutritious. A wholesome way to let the good times roll. One of the awesome joys of being part of a Community Supported Agriculture (CSA) farm share is getting my mittens on brilliantly colored vegetables, then playing around with them to make neat things. Often, if you're not already enjoying a farm share or farmer's market, I'll tell you you're S.O.L. 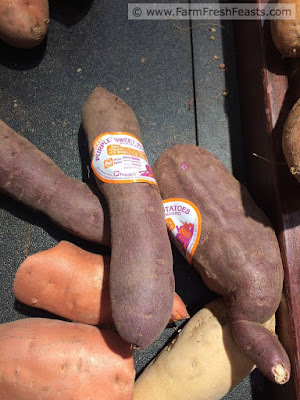 in terms of finding unique vegetables. Not this time. 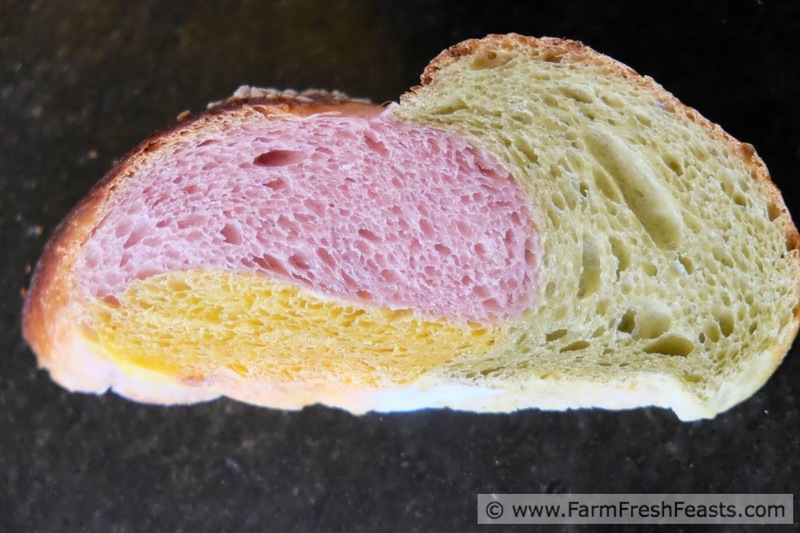 You could hit a regular grocery store and make this bread. For more recipes using sweet potatoes, please see my Sweet Potato Recipe Collection. It's part of the Visual Recipe Index by Ingredient, a resource for folks like me whose farmers grow delicious sweet potatoes that end up hanging out in my Strategic Winter Squash Reserve waiting to jump into game day appetizers and chili. Want more recipe ideas? Follow me on Pinterest. Want interesting articles that catch my eye? Follow my FB page. Want snapshots of my day? Follow me on Instagram. Want to know How To Use This Blog? Want to come clean my house? Pretty please? Just like when I made Overnight Sweet Potato Monkey Bread, from the book Make Ahead Bread: 100 Recipes for Melt-in-Your-Mouth Fresh Bread Every Day (Amazon affiliate link), someone else suggested I try using the purple and orange dough with something green for a Mardi Gras treat. I don't know which blogger or FB friend it was, though, so I don't want to give credit to the wrong place. 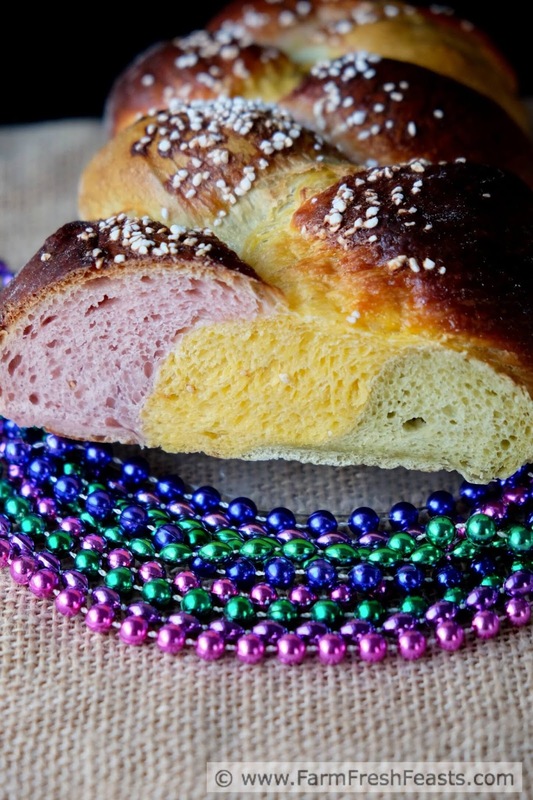 Just know it wasn't MY idea to add a green dough. 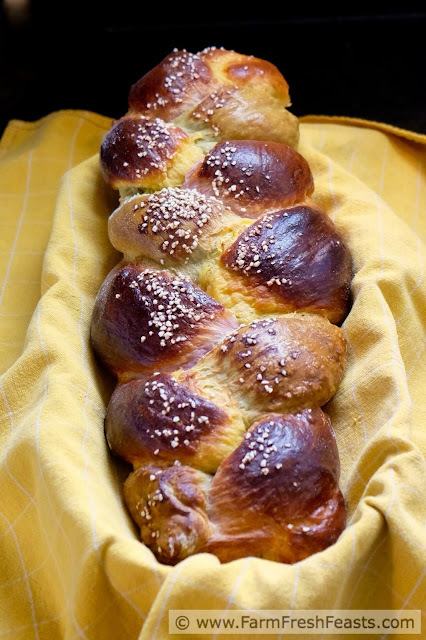 However, I did choose matcha for the green color, made a matcha dough (thanks to my bread machine as it's 55 degrees in the kitchen this winter and my yeast ain't got time for that) and baked this bread. I may not have had the idea, but I did have the execution. And you can make it too. Because each dough recipe makes enough for 3 loaves, this makes 3 braids. You're welcome to bake all 3 and give away what you don't need, or freeze the unshaped dough balls for a later use. Since I froze my sweet potato doughs for 2 months, I know they thaw just fine. The baked bread also freezes well, if you thought to take it in to the shop and left it on the counter . . . I just threw everything in my bread machine, following the manufacturer's instructions, pushed the Dough Cycle and went to fix a cup of tea to warm up since my kitchen is a yeast-hostile environment in the winter. If you're not going to do that, then warm the milk gently and add to a large mixing bowl like the bowl of a stand mixer. 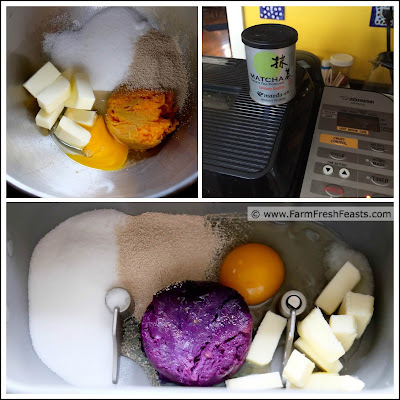 Dump in the butter, 2 eggs, salt, sugar and matcha and blend together using a paddle. Add the yeast and flour, mixing with a dough hook until it is a smooth and sticky ball. Transfer to an oiled bowl or bag, and refrigerate until all the doughs are ready. Liberally flour a few pieces of parchment paper. When you're ready to bake, divide each dough into thirds. Set 2 pieces of each color aside. Using floured hands, stretch each portion of dough into a 12 to 15 inch long rope and lay on the floured parchment paper. Braid from the middle to one end, then turn and repeat. If you're baking all 3 loaves at the same time, good on ya mate, repeat with the remaining portions of dough. Otherwise chill or freeze the additional portions. They'll last in a freezer bag in the freezer for at least 2 months. Thaw overnight in the fridge. Beat the remaining egg in a small bowl. 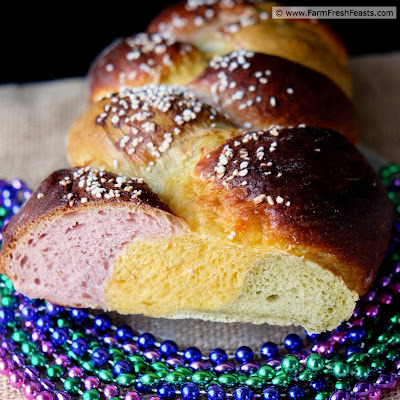 Brush the braided loaves with beaten egg, and sprinkle with about a Tablespoon to 1+½ Tablespoons coarse sugar. Let the bread rise for about 30 minutes until it looks nicely puffy, not morbidly obese. Preheat the oven to 375 degrees Fahrenheit. Bake on the parchment paper (I bake bread on my pizza stone, but use a cookie sheet if you like) for 20 to 30 minutes until golden brown. Cool completely on a wire rack before slicing. Repeat with other loaves. This makes 3 braided loaves of bread. 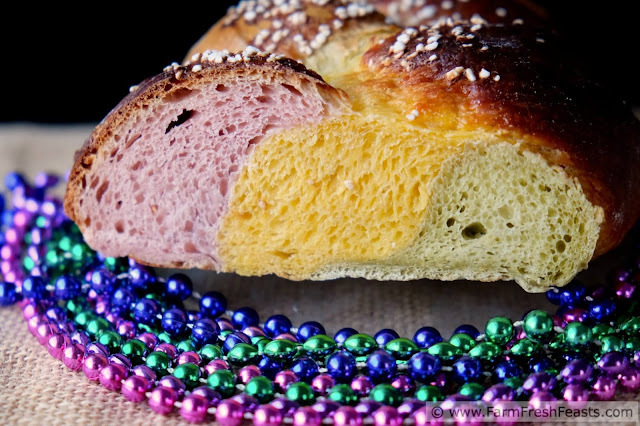 You can call this pulla or Mardi Gras bread or anything else, but to me it's gorgeous, multi-challah:) Love it. It's such a small food world. In my kids' elementary school there is a book called Everybody Eats Rice (or Everybody Cooks Rice, something like that). It's about an American kid who is hungry, but his mom is cooking the Uncle Bens (or whatever) and it's not ready yet so she sends him out the back door to play. He goes to his Chinese next door neighbors who are making a fried rice dish and has some. He goes to his Indian neighbors who are having biryani. He goes to his Italian neighbors and has risotto, he goes to his Central/South American neighbors and has rice & beans. By the time his mom calls him home, he's too full to eat! I think of that story when I notice the similarities in foods from around the world. And yes, a long way to say--yep, just like challah this is an egg/milk enriched bread dough that's braided before baking! Fun with colors, natural ones at that, plus carbs. I love it. Let the good times roll. Which makes me think of The Cars, more than anything else. I wish you luck! I found green tea powder in the Asian section of one market, and in the tea section of another. 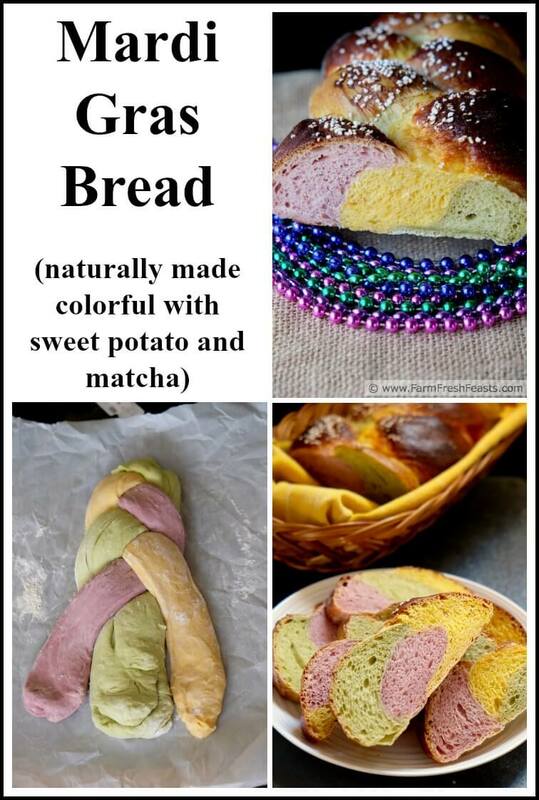 I'm pretty sure green food coloring would give the color you want, hopefully without an icky aftertaste.